Large corporations may rule the vast landscape of business, but with the recent slew of mega-corporations such as Toys ‘R’ Us and Maplin crashing and burning, it’s clear that bigger isn’t always better. SMEs, such as ours, make up the largest fraction of companies operating in the UK – with 99% of the 5 million businesses being qualified as SMEs. However, being an SME doesn’t mean we aren’t liable to a fate like the Nation’s nostalgia gem, Toys ‘R’ Us. In fact, we are more liable and with SMEs employing 60% of the UK workers, saving money is more important than ever. And one fool-proof way to save money (you can certainly trust us on this) is switching over to VoIP. You may already be using VoIP, or you may be looking around for new VoIP solutions, but what exactly is VoIP and why should you consider it? VoIP, (voice over internet protocol), also known as Hosted Telephony refers to the idea of making calls over the internet as data rather than a traditional analogue phone system. Check out our FAQ on VoIP if you’d like to know more about how VoIP works. Or download our Free VoIP guide. By switching your business to a Hosted Telephony system, you’ll find that call costs will be considerably reduced. Unlike traditional phone systems, VoIP allows users to make international calls without the almost extortionate rates non-VoIP users would receive. With calls moving as data, a business using Packnet would be able to get free calls between employees in different countries. In addition to that, calling VoIP-to-VoIP is becoming the more cost-effective option since charges are very straightforward. This is due to VoIP users not having to rely on a fixed monthly fee, unlike traditional phone users. With us as your provider, your company will also spend less on upkeep and infrastructure. Another great point of a VoIP system is its flexibility. 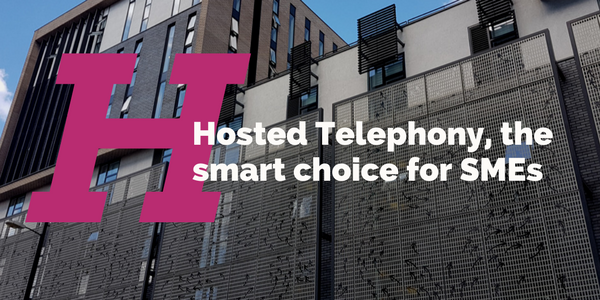 With VoIP, you can do a lot more than you could with an analogue phone system, from seamlessly adapting to a growing or shrinking business to a change in office location, Hosted Telephony is clearly superior. Let’s say you want to change the geographic area code of your business number? Well, with VoIP you can easily change the area code of your number since VoIP is not geographically dependent. In addition to that, if you move premises all you need to do is plug your phone in. Now that we’ve got the basics of VoIP down, we need to talk about IP Phones. As it is with all devices, the prices can range from high to low, however, with such a vast range of phones available, you can certainly pick the best phone suited to your business and budget. Whilst IP Phones may shake the wallet, they have no hidden costs and are known to have HD call quality. 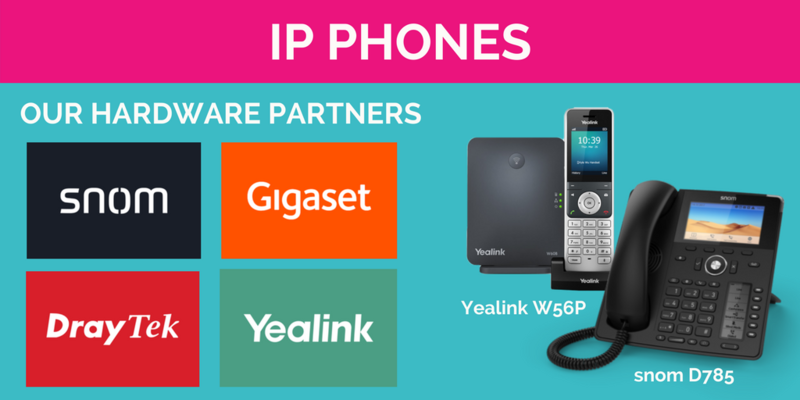 Here at Packnet, we are currently partnered with four hardware providers – snom, Draytek, Yealink and Gigaset. Softphones are software that can be installed on a device for the purpose of VoIP. They serve as an alternative to using specific hardware like the IP Phones mentioned above. Softphones are more cost-effective than hardphones and are easily deployed. However, the audio quality is reliant on your mobile data signal. Nonetheless, softphones are an amazing cost-effective alternative to hardphones. We hoped we’ve explained enough. If you still have questions, don’t hesitate to enquire or read our free VoIP guide.